Bucky Reed: Are those dots elk? We stopped at several overlooks in the blast zone of the volcano. This valley was miles away from the crater, but was still fairly barren. 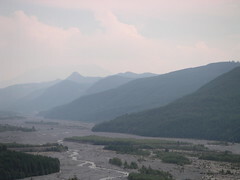 This valley used to be a river valley, but the eruption filled it full of silt up to 200' deep in some places. Dad insisted that there were elk in the valley but I never saw any.